The holidays are a magical time in Center City. From dazzling light shows to pop-up shops and the Made in Philadelphia Holiday Market sponsored by B101.1 in Dilworth Park, visitors and locals alike love the city’s unique shopping experience rich with family-friendly fun and everyone’s favorite holiday traditions. 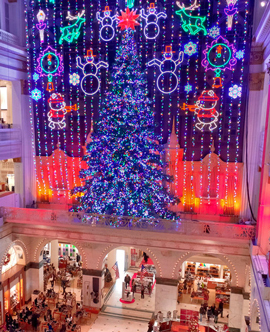 Shop Center City and discover the array of seasonal surprises that await. Enjoy holiday parking specials from the Philadelphia Parking Authority, retail events exclusive to Center City, and the ultimate holiday gift guides for presents sure to please. The best gifts to give and get this holiday season are in Center City. Visit ShopCenterCityPhilly.com because if it’s in, it’s in Center City. Follow @ShopCenterCity on Instagram and twitter. Share your favorite shopping finds with #ShopCCPhilly. Quizzo hosted by Johnny Goodtimes runs every Tuesday from 6-8pm in the Rothman Orthopaedics Cabin. Bring your friends to enjoy drink specials and try your hand each week for a chance to win prizes. Winners will receive free tickets to the Vikings: Beyond the Legend exhibit at The Franklin Institute through March 3. Due to the holidays, there will be no Quizzo on December 25 and January 1, 2019. From 5-7pm enjoy Cocktails and Cold Ones in the Rothman Orthopaedics Cabin with a seasonal menu and specially priced EFFEN Vodka cocktails, Bud Light draft beer and a selection of wines, plus weekly ticket giveaways from The Met. Wednesday, December 12, features a special Temple Takeover for Temple University Alumni. Learn more @TempleAlumni. College students pay $2 admission* to skate at the Rothman Orthopaedics Rink every Thursday from 5-9pm with student ID. Skate rentals are not included. *Discount cannot be used in conjunction with other offers. For more information about winter events, visit DilworthPark.org. Skate, stroll, shop, eat and drink. The coolest activities and events are taking place in Dilworth Park. 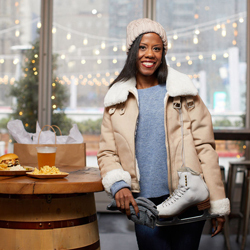 The Rothman Orthopaedics Ice Rink is an unparalleled entertainment experience on Philadelphia’s center stage. Nearby, warm up with festive drinks and seasonal fare in the Rothman Orthopaedics Cabin- a cozy place to view the Deck the Hall Light Show. Showcased nightly, the Deck the Hall Light Show presented by Independence Blue Cross and partner 6abc brings City Hall to life with the sights and sounds of the holiday season. On the southern end of Dilworth Park, the holiday-inspired Wintergarden is full of holiday topiaries and twinkling lights for picture-perfect moments surrounded by the Made in Philadelphia Holiday Market. For more information on Winter at Dilworth Park, visit DilworthPark.org. Center City District Restaurant Week, presented by Marker’s Mark Bourbon and El Tesoro Tequila and supported by OpenTable and Lyft, is more popular than ever and is returning in January for nearly two weeks! From January 13-25, 2019, more than 115 participating restaurants will serve three-course dinners for $35 per person and three-course lunches for $20 per person (excludes tax, gratuity and alcohol). New restaurants for this season include Bai Wei, Sedition and Fat Salmon. Lyft is your official ride for Center City District Restaurant Week. 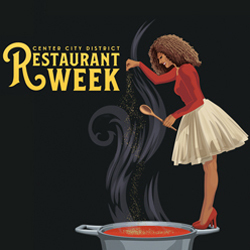 Visit CCDRestaurantWeek.com to see the full list of participating restaurants and links to make reservations via OpenTable, and enter for a chance to win dinner once a week for a year at select Center City restaurants and a $500 TD Visa® Gift Card for a Center City shopping spree.